Companies trust Hansen Storage with their company documents. Our clients know the value of their office space - space that can be put to more productive use rather than just holding boxes of old documents. We can provide a complete documents management system designed for your inactive and semi-active records. We offer pick up and drop-off of your documents, inventory reports, cost saving pricing and no hidden fees. If you are thinking of storing your company records off-site, contact us to find out just how affordable and efficient our records management services are, or if your current record storage vendor is not meeting your needs, contact us to arrange a transfer to Hansen Storage and start saving money. Free Initial Transfer - Hansen Records Management will transfer all containers from your present storage facility to our document storage facility free of charge. Free Barcode Labels and Forms - All container barcode tags, transmittal forms, fax order forms, and client authorization forms will be provided free of charge. Trial Period - Upon execution of the "Storage & Service Agreement," we will provide you with a 90-day trial period. If you are not completely satisfied with the level of service we've provided, simply submit a written explanation to us of your dissatisfaction, and if it is determined that we are at fault, we will relocate all of your storage containers that are in our facility to a destination of your choice within a 30-mile radius of downtown Milwaukee free of charge. 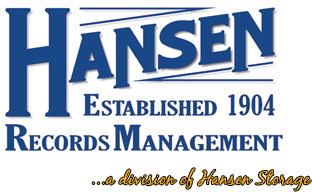 Computerized Barcoding & Tracking - Hansen Records Management uses RS-SQL document management software, the most advanced barcode tracking/inventory technology software available, to manage your inventory. RS-SQL features departmental reporting and invoicing and can create a variety of management reports in any data format you choose. Click for directions to our Record Management Facility.